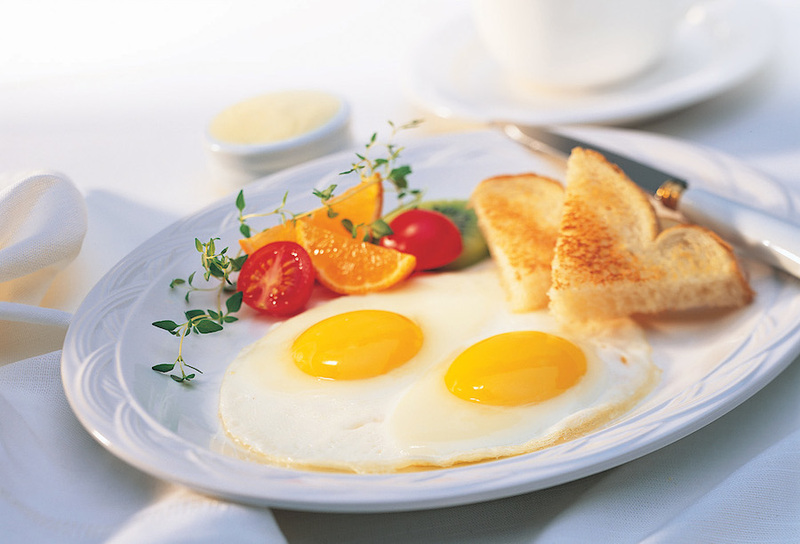 Although protein, like every other macronutrient, is a source of energy when consumed, this is not its primary role. 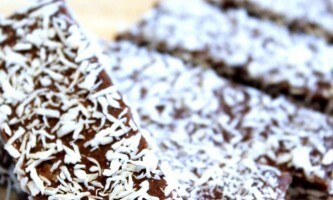 The primary role of protein is to develop and heal muscle tissue. 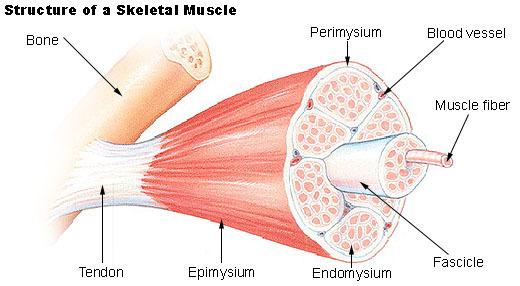 But before explaining why we need proteins, let’s see how muscle cells are structured and how they work. Each of these fibers are long cells that contain several nuclei; and this setup allows muscle contraction to take place; contraction happens when muscle shortens itself. A muscle fiber contains myofibrils; these myofibrils are composed of sarcomeres known as the contractile units. Sarcomeres are placed in front of each other, and this is what makes myofibrils. Each sarcomere contains two protein filaments: myosin (thick filament) and actin (thin filament) . Myosin filaments are attached to the center of the sarcomere, onto M lines, while actin filaments are attached to the extremities of the sarcomere, onto Z lines. 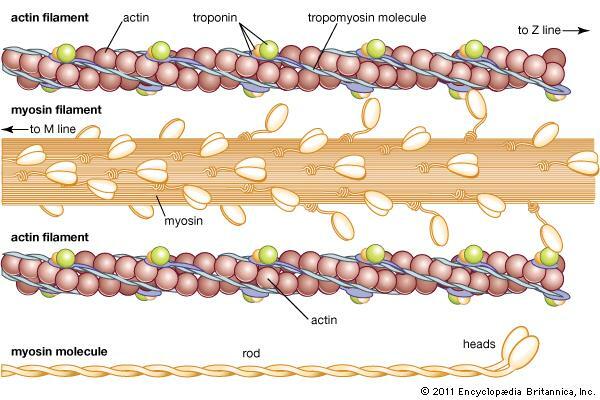 When actin and myosin filaments slide and cross each other, muscle contraction happens. While this mechanism is called “sliding filaments”, this contraction happens when myosin heads bind to actin receptor sites, and pull in actin. This contraction happens when an ATP molecule binds to myosin head, and is hydrolyzed to ADP + Pi (inorganic phosphate). This causes myosin heads to extend and bind to actin binding site : an actin-myosin cross bridge is then created. Thanks to this bridge between the two filaments, sarcomere shortens itself ; when actin fibers are pulled in by myosin. During this sliding, ADP + Pi are released, while myosin head remains attached to actin. A new ATP molecule binds to the head; this molecule either breaks the bridge (by releasing the myosin head), leading to muscle relaxation, or re-create it by extending the myosin head another time. In order to repair the tissue and prevent further damage (which may occur during your next workout), the muscle must regenerate itself and reinforce the cells that it is composed of. 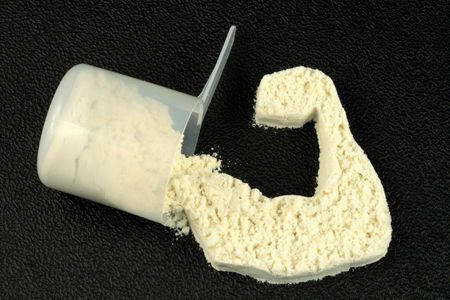 These cells, as most cells in your body, are composed of protein, and the body thus needs a great amount of protein, not only for recuperation but also for muscle development.